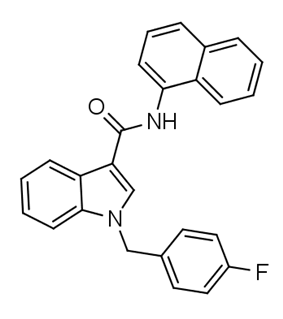 FDU-NNE1 (also known as FDU-NNEI and FDU-MN-24) is an indole-based synthetic cannabinoid that is presumed to be a potent agonist of the CB1 receptor and has been sold online as a designer drug. ^ Nahoko Uchiyama, Yoshihiko Shimokawa, Ruri Kikura-Hanajiri, Yosuke Demizu, Yukihiro Goda, Takashi Hakamatsuka (February 2015). "A synthetic cannabinoid FDU-NNEI, two 2H-indazole isomers of synthetic cannabinoids AB-CHMINACA and NNEI indazole analog (MN-18), a phenethylamine derivative N–OH-EDMA, and a cathinone derivative dimethoxy-α-PHP, newly identified in illegal products". Forensic Toxicology.